Joscha (left) introduces Tom to red cabbage and other typical German fare. After I enjoyed having Joscha for the first five months of his 10-month stay, I was delighted to be able to have Tom from Australia join us for five months. They have become good friends and share one another’s customs in addition to learning about life in Maine. 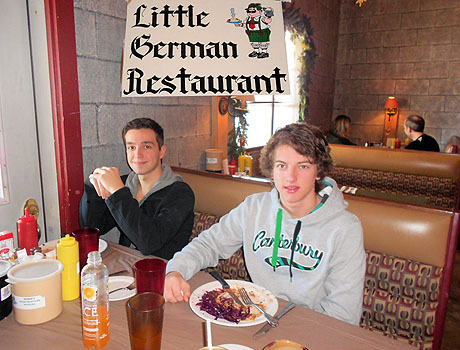 The picture shows the boys at a German restaurant where Tom is eating one of the German meals that Joscha described. Joscha enjoyed the restaurant’s adjacent shop, where many of the food items for sale were written in German. Joscha wants to be a doctor and has had some wonderful experiences at a local hospital. He joined the Patient and Staff Committee of which I am a member. He asks questions and offers his ideas. The hospital has arranged for him to observe some operations, including the removal of two bone spurs from my foot. Most if not all of the doctors delighted to have the opportunity to share information about their specialty.